The computer where I do my drafting and most of these blog posts is in my dining room, almost tucked directly under my layout. When I look up from the screen I can see this lovely model (seen in the above photo taken on Taylor’s workbench) on my layout and I still can’t believe I have one. I’ve been fooling around with a pile of 3D printing projects lately but this is one of my favourites. Furthermore the printer at Shapeways is now at a level, with regard to print resolution, that the quality is getting appreciably better. The model photographed above has not been sanded at all to remove any surface grain – pretty impressive eh?! Speaking of impressive this when I drew the windows on this little model I undercut the back face of each wall in the area of the window so that when glazing is added it’s almost flush. The model is nicely detailed with everything from class lights and rain gutters but it does not include the railings as they’d just be too large (and fragile) if printed. Yup, I feel pretty proud of this model and I’m looking forward to showing it off. This is another of those projects I’ve wanted to try for a while. 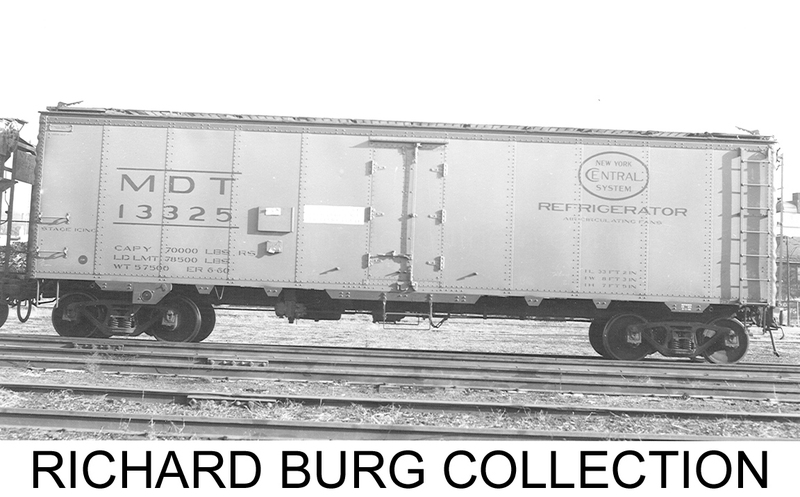 I love these plywood-sheathed CP vans (cabooses). Over the years I’ve often kitbashed stand-in versions based on the Bachmann, Model Power, or AHM three window, end-cupola cabooses by blanking out the extra windows in the body and cupola. While I’ve liked every one I’ve done they all are missing the proportions of the prototype. 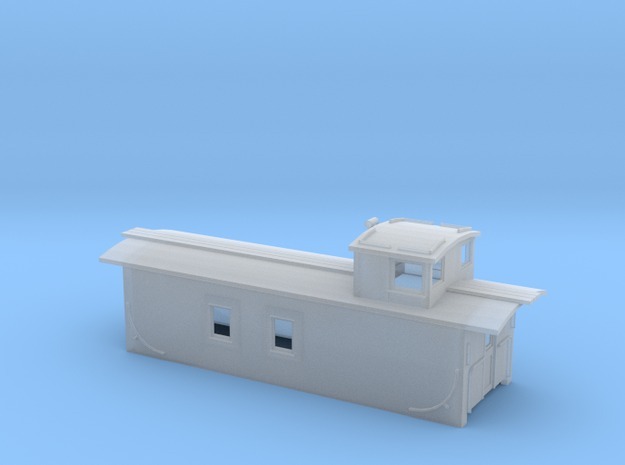 This model is designed to fit exactly on an Atlas or similar end-cupola caboose floor. This helps keep the costs down and if you select a newer production model, like the Atlas Trainman version, you not only get the floor but some nice, low-profile wheels, and Micro-Trains compatible couplers. I have included the railings as moulded on parts. With no real extra details required, all the modeller should have to do on receiving the model is to clean and prepare it for paint, paint, and finally rub on some classic CDS dry transfer lettering for these vans. Some previews of the Flexicoil sideframes. I think these are pretty close and these revisions should resolve the issues I found in the first iteration’s test print. I have decided to add in some more brake details. These should be separate parts but given their small size this might be worth attempting as a moulded on part. I think they look terrific and I can’t wait to see the second test print. Shapeways rendering shows the current state of the car – click on the link to see it the latest version on Shapeways. 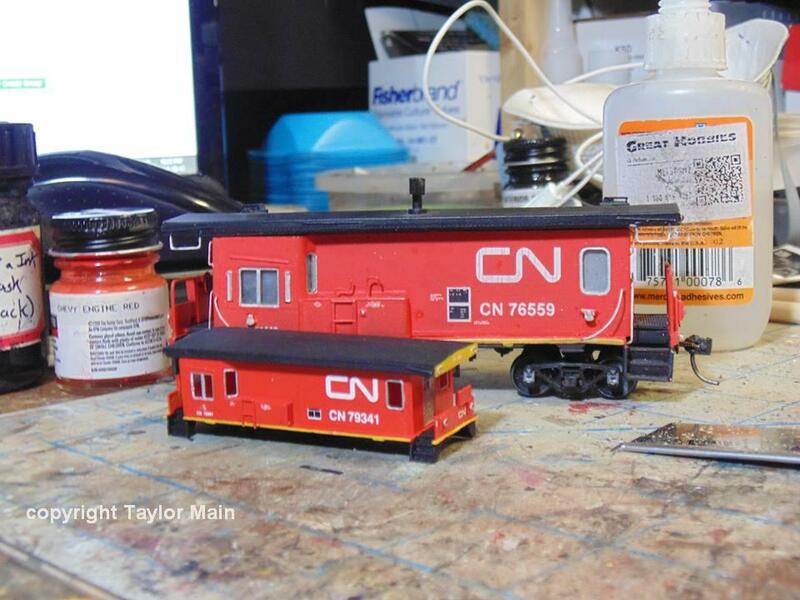 Here’s the latest rendering of the CN transfer van in N scale. So far I’m pretty impressed with how this is all coming together. The roof is designed to be removable and the car will be supplied with the roof as a separate piece. The floor is a part of the model and includes some very basic detailing. The bolsters are sized to work with a Micro Trains truck. I’ve included a 0.030″ diameter hole for the truck’s king pin as a centre guide but expect to ream this out larger for the trucks I’ll ultimately use. I will be adding in the smoke jack on the roof as well as some more details on the shell. I’ll be adding in the rain “gutters” over the windows and platforms. I need to add in the class lights on the roof. I’ll mark these out on the back of the roof casting too in case you want to drill them out to install fibre optic or pico LED lighting. (The roof is hollow to make it easier to route the wires). Finally I’ll mark out the panel seams on the body. I’ll try to do this in a way that makes it easy to highlight them when painting and weathering while still making it easy to clean and polish the shell while preparing it for paint. I don’t plan on incorporating much underfloor detail on this one as it’s just as easy to use up some detail parts and wire to assemble. I don’t have any photos of the underside of these cars and would rather leave out detail than just guess. The generator is there, so it’s a start. I’ve been debating on the subject of the handrails. This car will only be available in Shapeways’ Frosted Ultra Detail and the material really isn’t suitable for handrails – it’s just too brittle. More than just brittle, I’d need to create handrails that are just too thick (I tried including them and they looked like the were made from sewer pipe). It’s really easy to make up handrails from wire and given the vastly improved appearance I will likely elect for this route. I expect the single car will sell for around $25 and I can offer a pair of them on the same print for around $40. I expect to order a test print of this car in the next few days and if everything with that goes okay they’ll be available in my Shapeways store in the next couple of weeks in case anyone else could use one. Set of four sideframes. The production version will have a different layout to save on printing cost. It’s been quite a while since I posted an update on the RSC13 sideframe project. I think the last I wrote was an update that my set of four had been shipped from Shapeways. Though I’ve been openly critical of Shapeways past insistance on using only UPS to ship parcels to Canada I’m excited that they now offer a United States Postal Service option. It was never about the cost of shipping, I just find that UPS shipping to Prince Edward Island is about as reliable an option as just firing the parcel into the nearest river and relying on time and tide to bring the order. This post isn’t about UPS. I wanted to update on the RSC13 sideframe project and where I’m at with that and to do something I should have done just about two weeks ago: thank Shapeways and recognise supber customer service. Once you’ve placed your order with Shapeways they provide a web page where you can track your model through the printing process. As the print job nears completion they add the parcel’s tracking number and a link to the shipper’s website so you can track its trip to you. My model had travelled through the Shapeways process meeting all their projected timeline points and it left Shapeways as they planned. I copied down the tracking number and periodically checked the USPS website to see if it was closer to the Island. USPS’s service standard for the parcel put a delivery time of around ten working days. Around day fourteen my parcel hadn’t arrived. I’m not in any rush for these but wanted to ask in case there was anything going on I wasn’t aware of. Within a few minutes of my sending Shapways an email I received an auto-reply notifying that my question had been received. What impressed me so much was that well within that first hour, I received my first personal email from Shapeways. No generic email either. A nice personal note to let me know they’d seen my note and to reinforce that they were going to see what happened. By the end of hour two, I’d received two more personal emails. Both were really nicely composed notes and by the end of the third they apologized and offered to re-print the model and send me a second one. I replied that their extra attention was appreciated but unnecessary, that I was okay to wait. They insisted and I took them up their offer. Shapeways had done their job printing my parts but immediately took responsibility for USPS loosing the parcel. I am so impressed with their personal attention and the way they offered to take responsibility for developing a solution that suited us all. A lot of folks do a lot of talking about owning a process and last week, Shapeways really went out of their way to prove their commitment to their service and their customers. I’m really impressed and already looking forward to doing more business with them. Now, back to the trucks. On July 8th they shipped my second set of sideframes. I’ve been following this on on USPS’s website and today the parcel cleared customs. I fully expect to be holding onto them this coming week and I am pretty excited. I have a Kato RSC2 here (thanks, again, Greg!). I expect within minutes of getting the parcel I’ll have a photo to post showing how these look on the stock Kato truck they were designed for. I already have the final version of the drawing ready to post to Shapeways and if everything goes to plan, I’ll open the model up for ordering on the Shapeways website by the end of this month. Progress on the CAD work for the HO scale RSC14 trucks continues, though at an almost glacial pace lately. Apparently the Kato RSC2 truck has the correct wheelbase and it’s sideframes clip to the sides of the gearbox much in the same way that a Athearn or Proto sideframe would. I’ll try and design a similar set of posts on the inside of these sideframes so they are simple “plug and play” parts for the Kato trucks. The Kato RSC2’s have been out of production for a while but they are still common on eBay.ca and various hobby shops. I’ve been able to vist RSC14 #1762 in Kensington and hope to see #1754 soon to finalise some dimensions before releasing the CAD to Shapeways.com. I’m pleased with the progress so far and excited about how much more detail we can pack into the HO ones compared to the smaller scale versions I had actually started out drawing.